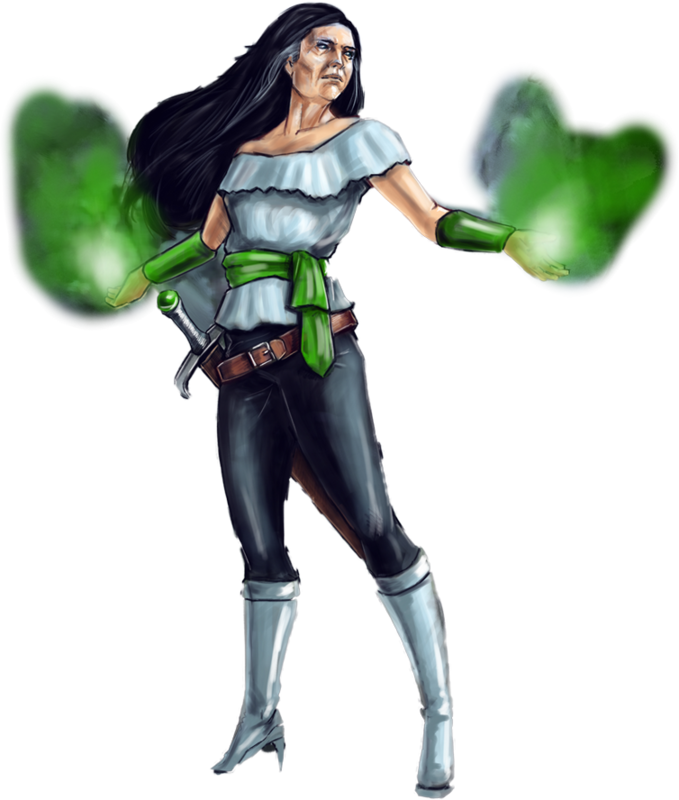 Diabla has over a dozen dark spirits living inside of her, each of which gives her hyper abilities, including enhanced speed, strength and agility, as well as flight and invisibility. She can also use astral projection, which allows her unleash spiritual energy. Diabla is an expert swordswoman and often carries a large blade. Isabella grew up in the beautiful town of Nicoya, Costa Rica. Her mother worked as a roadside vendor, selling fruits and vegetables to locals, tourists and passersby. And when she was old enough, Isabella began working alongside her. She didn’t know her father, but it seemed many of the other street vendors (of which there were many), knew him well. Or at least they knew of him. The stories she heard about her father were of the mythical nature. Apparently, Isabella’s father was cursed. It was rumored that he had committed crimes against the church – the greatest of which was stealing and selling some freshly cut wood that was supposed to be used for the construction of a crucifix. Because of his deeds, as the legend would have it, he was stricken with an unquenchable thirst for wine. Isabella was told that no matter how much he drank he would tirelessly roam the streets in search for more. This left him in a perpetual state of drunkenness and the story was often used as a precautionary tale; a reason to always treat the church with respect. But that wasn’t all. Isabella also learned that many people believed her father had powers such as flight, invisibility and astral projection (the ability to separate his spirit from his body). They believed that he had gained these powers from drinking a special wine given to him by a “ghost orphan.” These ghost orphans were ancient lost souls who had been denied residence in both heaven and hell. And though no one had ever truly confirmed the existence of ghost orphans, everyone in Nicoya was positive Isabella’s father knew one quite intimately. For most of her childhood, Isabella was shunned by her peers, as no one wanted to be friends with the daughter of a drunken malevolent spirit who hung out with lost souls. As she got older she became interested in trying to find out what truly happened to her father, but her investigations usually led her to more legends, myths, hearsay and rumors. Finally, as a teenager, she abandoned her search and turned her attention elsewhere: Fitness. Nicoya is one of the five places in the world designated as Blue Zones, which meant that, among other things, physical fitness was a huge part of the culture and lifestyle. Isabella took that to the extreme and began working out incessantly. She would hit the gym on a daily basis and eventually hooked up with a coach who began training her for fitness competitions. By the time she was 25 she was competing all over the world. Isabella also took up fencing. With the money she had earned from competitions, she was able to afford to hire and train with some of the greatest fencers on the planet. This was her life for the next 30 years: she exercised and she fenced. She retired from competitions at about the age of 55, but continued to work out on a regular basis. In fact, during every check-up her doctors were more and more impressed that her physical condition had not suffered the same problems most people her age dealt with. Despite being nearly 60, Isabella’s body and health was the pinnacle of perfection… for a 20 year-old. Isabella considered herself fortunate. However, there was nothing accidental about it, as she would soon find out that her mysteriously absent father had a lot to do with who she was and who she had become. One night, in her home in Costa Rica, Isabella awoke to the sound of an intruder. She grabbed a sword, which she kept by the side of her bed, and prepared to make this person sorry, but when she went to attack she came face to face with an elderly – but ridiculously fit – Japanese woman. She introduced herself as Nozomi, and informed Isabella that she knew her father quite well. Believing her words to be an insult, Isabella attacked the woman, but was surprised to find that Nozomi had hyper-abilities. The former fitness model skillfully wielded her blade, but her adversary’s speed was undeniable and her ability to unleash poisonous liquids from her fingertips was overwhelming. Isabella was defeated within minutes. She surrendered and awaited her fate. However, Nozomi was not there to kill her. Nozomi informed Isabella that many of the legends she had heard was true. Her father had been a thief and had been cursed. And he had roamed the Earth aimlessly for some time before encountering a ghost orphan. The ghost orphan inhabited his body and gave him supernatural abilities. Subsequently. a number of circumstances eventually brought him into contact with Nozomi and together they had traveled the world “getting into all sorts of adventures,” as she put it. Despite their globetrotting, however, her father had made it a point to visit Costa Rica a few times of year. He would come to Isabella as she slept and project his spirit into her body for short periods of time, the result of which would enhance and maintain her physical condition, allowing her to stay fit and healthy well into her old age. Isabella, as you can imagine, was blown away. But it was the next bit of information that truly floored her. The physical body of Isabella’s father was dying and his spirit would need a new host. He wanted that host to be his daughter. Isabella considered this insanely ridiculous request, but refused. How could she agree to do something so out-of-this-world? And furthermore, how could she agree to help the man who abandoned her and her mother? She asked Nozomi to leave and never come back. Nozomi did not comply. Instead she attacked Isabella and told her that one way or another, she would become the new host for her father’s orphaned spirit. She blasted the swordswoman with just enough poison to bring her to her knees, then pulled out a small ornamental box. She opened it to reveal her father’s spirit. Nozomi promised that it would be a swift and painless process to infuse Isabella with the spirit. However, as Isabella’s soul was pried open, it was not just her father’s spirit that entered in. In fact, a RUSH of spiritual energy swept through her home as more than a dozen spirits suddenly possessed Isabella’s body. The force of the spiritual explosion blasted Nozomi back and through a wall of the house. She dusted herself off and looked up to see Isabella standing before her. The former fitness fanatic was glowing with spiritual energy… dark spiritual energy. Nozomi’s actions had produced unintended results and now she was in a fight for her life, as Isabella attacked with extreme speed, strength and skill. Nozomi barely escaped. Isabella embraced the spiritual forces inside of her and worked to hone the plethora of ghostly abilities they afforded her. She began terrorizing the people in her town who had ridiculed and shunned her and her mother all those years ago. Before long the legend of “Diabla” was born. One day Diabla received an invitation to something called a Blue Zone Convention. She traveled to Honolulu and was introduced to a number of other senior citizens with powers. Most of them were good-natured people, but a few of them were just as cantankerous and hellbent as she was. She found kindred spirits (pun intended) in RC Allen and Slasher Vinnatori. But it was a woman calling herself “Chaos” Kao Kwan with whom Diabla felt the closest connection. And that’s because Chaos was the daughter of Nozomi. Both of them felt the need to exact revenge on the woman, and so they formed an alliance. Along with RC, Slasher and a fifth member, Stavros “The Annihilator” Anatoli, they set out to find that revenge, and cause widespread havoc at any and every opportunity. This havoc eventually brought the Blue Zone Killers (as they began calling themselves) in league with Edgar Lockhart and Reina Valencia, the owners of the evil corporation, Universal Intelligence. The company was a worldwide leader in illegal experimentation on hyper-humans and because of their dastardly deeds a group of super ladies called the Sista Clique had vowed to take them down. Edgar hired the Blue Zone Killers and added them to his collection of super-villain associates. After several battles with other members of The Blue Zone Killers, it was time for the Sista Clique to face the power of Diabla! As Kharma Lucky and her team attempted to breach the force-field that surrounded Universal Intelligence World Headquarters, Diabla attacked and unleashed the full spectrum of her powers. The Clique fought back valiantly, but eventually the dark spirit, along with the help of the other Blue Zone Killers, was able to overwhelm them. Furthermore, Reina Valencia wanted two of her scientists, DeMarco Scienza and Robert Kilby, to experiment on the telepathic mind of Kharma Lucky and eventually use it to enhance their psycho-tech artificial intelligence program. With the Sista Clique now desperately trying to survive the onslaught of the Blue Zone Killers, Diabla was able to swoop in and grab the hyper-cognitive heroine. The others tried to react, but it was too late – Diabla phase-shifted through the force field, taking Kharma with her. Their friend, and teammate, was gone!